His Holiness Dr Syedna Mufaddal SaifuddinTUS is on his first visit to Malaysia, a country that is home to a thriving Dawoodi Bohra community. During his first address to the community following his arrival, His Holiness emphasised the importance of love for one’s country. He narrated the prophetic tradition that states that love for one’s homeland is integral to faith, and urged community members to be model, law abiding citizens of Malaysia. Before him both the 51st and 52nd dais have made visits to the country, the former in 1953/54 and the latter in 1979 and 1997. At 10am on Saturday 21st July 2018, Syedna inaugurated the newly built masjid in Kuala Lumpur and named it Shujai Masjid coinciding as it did with the urs (death anniversary) of the 33rd al-dai al-mutlaq, Syedna Feer Khan ShujauddinRA. In his discourse, Syedna highlighted the importance of purity of mind, body and actions. He then related a short narrative about the Prophet ʿIsaAS (Jesus) who once came across a group of fullers outside the city who made their living cleaning and whitening clothes. The ProphetAS asked them what they would think of a man who donned a freshly laundered garb while his body was soiled? They answered that he would be an imbecile to do such a thing! The Prophet replied that those who tend to their physical appearance and clothing with great care while neglecting to purify the soul are much like the man who dons clean garbs on a soiled body. His Holiness employed this narrative to stress the importance of inner purity. 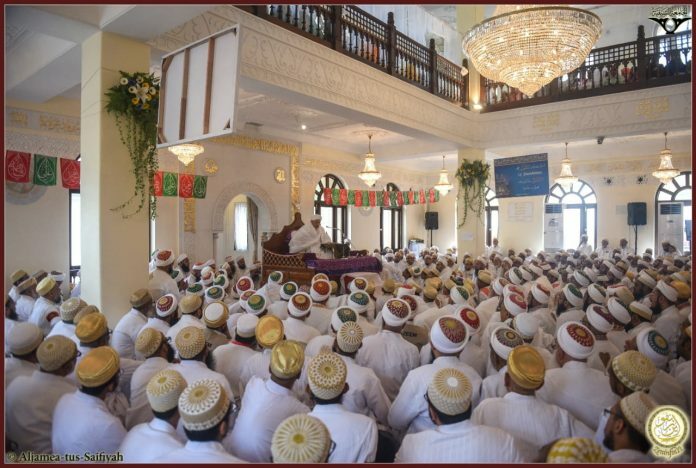 He stated that purity of the mind and soul, word and deed, should be a hallmark of the Bohra community, in tandem with physical and environmental purity.